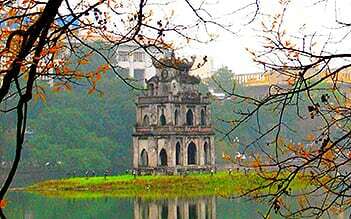 As its name suggests, this tour just cover some main attraction of Vietnam from North to South. Visit Hanoi and world heritage site of Halong Bay in the North, Nha Trang and Hoi An in the center, and Saigon, Mui Ne in the south. Refresh yourself between wonderful natural landscapes, history, gastronomy and superb monuments! Your tour will begin with Halong Bay trip. It takes about 3.5 hours from Hanoi to Halong Bay – World Natural Heritage site. Warmly welcome by all staff on board and set sail in the bay. While lunch is served, the junk sails slowly through the fantastic scenery of the magical bay, where thousands of sculpted limestone islands rise from the waves. After lunch time, Cruise takes a stop at a peaceful island and we have time enjoying panoramic view of the bay. Besides, we can take part in available activities such as kayaking, swimming on cool water, walking along beautiful beach or sunbathing on the sundeck are also exciting. Late afternoon, we will have chance to visit an interesting fishing village and communicate with local people know more about daily life who have been living for nearly three generations. Back on board, enjoy the peaceful sunset on sundeck then great dinner at restaurant. Cruise back to the dock around noon. You will be transferred to the airport for flight to Da Nang. It will take about 1 hour 20 minutes. Welcome by our driver in Da Nang Airport then we will be transferred to hotel in Hoi An. Check-in, free at leisure the rest of the day and overnight at Hoi An Hotel. Free at leisure until being picked up and transferred to Da Nang Airport by our driver for your flight to Nha Trang. 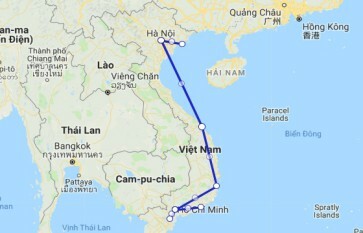 It takes about 1 hour to fly from Da Nang to the beach capital Nha Trang. Upon arrival at Nha Trang airport, be welcome and picked up by our driver to transfer to Nha Trang Hotel. Check in and free at leisure to enjoy the offerings of this city. Overnight at Nha Trang Hotel. Nha Trang is a perfect choice which offer very nice weather & good reasons for travelling! Highlighted places include Hon Mun Island, where you can snorkel and see tropical fishes and the coral, and Hon Tam Island, where you can swim & relax on the beach. Free at leisure until being picked up and transferred to Nha Trang Airport by our driver for your flight to Ho Chi Minh of about 01 hour. 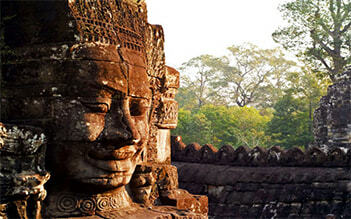 Upon arrival at Ho Chi Minh airport, be welcomed and picked up by our driver to be transferred to Ho Chi Minh Hotel. Check-in and free at leisure the rest of the day. Overnight at Ho Chi Minh Hotel. Leave your hotel in the morning around 8.00am, we depart to Ben Tre area for a full day boat trip. Start cruising along the Ham Luong river - a branch of the Mekong and stop at various local workplaces to give you information of the local works, including a brickworks, where bricks are still painstakingly made by hand; a coconut processing workshop, where you can sample fresh coconut and see how every single part of this versatile nut is turned into food and other products; and a mat weaving house, where straw mats are woven using a hand loom – you can even have a go at weaving yourself! Then boat will stop at a quiet village where you can have a short walk to experience real Delta village life. Later you will board on a xe loi (a kind of motorized rickshaw) and travel into the forest where you can visit fruit orchards. Then we will stop at a riverside restaurant for a delicious and filling lunch, featuring such local specialties as elephant-ear fish and river shrimp, washed down with some cold drinks or beers. 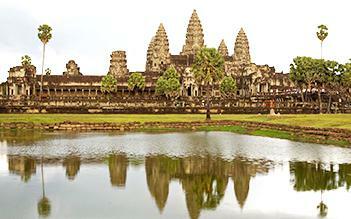 It’s time to board on a sampan for a relaxing trip along narrow canals. Take boat back to pier. Our driver will meet your again and drive back to your hotel in Ho Chi Minh City. Have breakfast at hotel. We have 2 days for free at leisure activities by yourself in the city centre such as sightseeing, enjoying local food, shopping. In the morning, have breakfast at the hotel and get picked up for a transfer of about 4.5 hours to Phan Thiet, where boast one of Vietnam’s biggest production of fish sauce from sea fish as well as one of the best beaches in Vietnam. Enjoy the scenic road along way, passing Phan Thiet Town and arriving at Mui Ne. Spend the next three days on the beach in Mui Ne. The beach is famous for fresh seafood, white sand beaches, the charming fishing villages, the desert-like dunes and numerous types of rare flora and fauna. In the morning, have breakfast at the hotel. Free at leisure or enjoy your last swimming at Mui Ne beach until transfer to come back Ho Chi minh City. 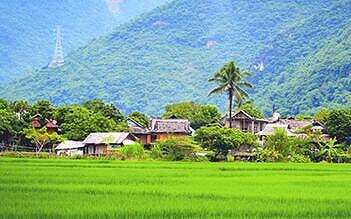 On the way, enjoy the scenery of the charming countryside and the smiling faces of the people. Upon arrival at Ho Chi Minh airport, connect with your departure flight. End of our services. 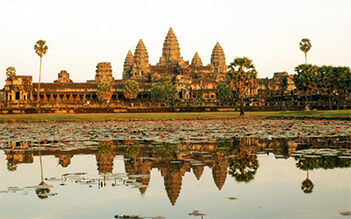 Excellent Excellent organization, very well trained tour guides and comfortable cars. Also, excellent itinerary, totally recommended.